Inside U.S. v. Ulbricht. Illustration by Susie Cagle. On October 2, 2013, Ross Ulbricht was arrested at the Glen Park branch of the San Francisco Public Library, his laptop open and connected to the library wi-fi. The government claims he is the Dread Pirate Roberts, the infamous kingpin of the Silk Road, an online black market for drugs and other illicit goods. 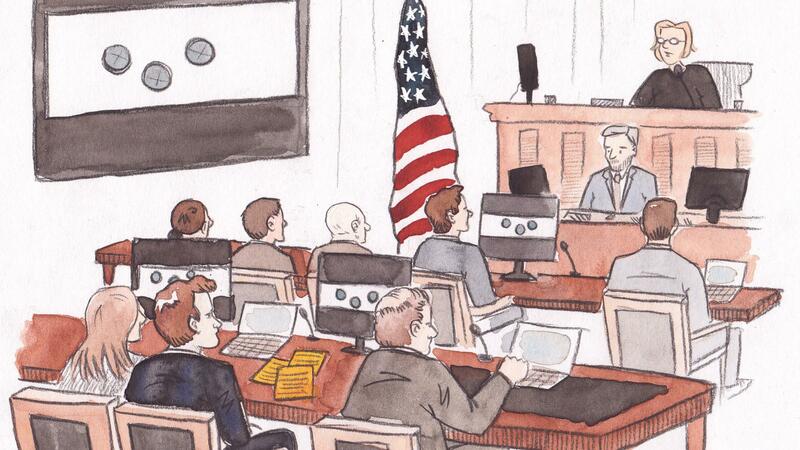 Ulbricht’s trial began today, after many delays over the last few months. The prosecution said in their opening statement that he was “literally caught with his fingers at the keyboard, running the Silk Road.” And that was just the beginning: the laptop was not only logged into the Silk Road, it contained chat logs and other files, including a journal. Between these files, the information seized from the Silk Road server, and various drug dealers turned witness, Assistant U.S. Attorneys Serrin Turner and Timothy Howard seem confident they can prove beyond a reasonable doubt that Ross Ulbricht is the Dread Pirate Roberts. 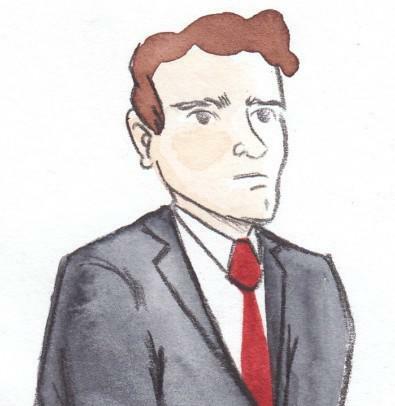 The defense’s theory of the case is a deft form of legal jiu-jitsu, taking the numerous technical faux pas of Ross Ulbricht and some of his inexplicable behaviors (documented extensively in the media), and using them to bolster the assertion that Ulbricht could not be the criminal mastermind described in the indictment. Their theory might square away with some of the odder details in the case. The Dread Pirate Roberts’s early operational security failures may make more sense if there are multiple DPRs of varying technical competence. In the heyday of the Silk Road, the Dread Pirate Roberts was notoriously secretive when dealing with his own lieutenants. Yet Ross Ulbricht used his own personal Gmail address when making forum accounts to promote the Silk Road in its early days. Note, also, that in an interview with Andy Greenberg in 2013, the Dread Pirate Roberts claimed to have inherited the site from a predecessor. The defense states that Ulbricht was merely a speculator in Bitcoin, making his fortune off the huge fluctuation in the market that occurred from 2011 to 2013. (By the end of 2011, 1 BTC was about $2. In October 2013, when Ulbricht was arrested, 1 BTC was about $140). 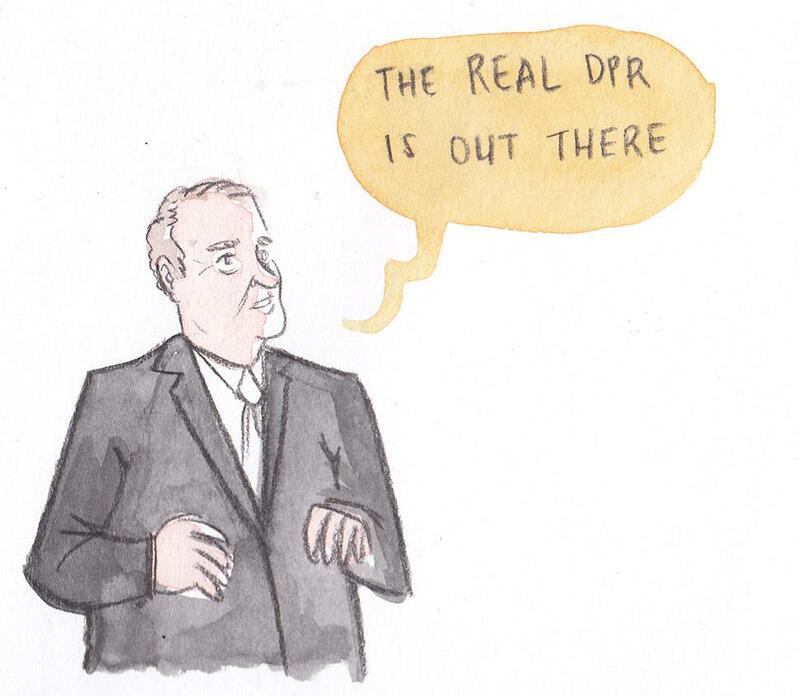 Ross Ulbricht at trial. Illustration by Susie Cagle. As for the physical, offline Ross Ulbricht, his appearance in court today was the first time the public had glimpsed him since his bail hearing in November. When he first entered the courtroom, he seemed in good spirits although he looked sallow and pale. Tall, thin, and clean-cut, the 30-year-old appeared in a navy blue blazer, khaki pants, and tie. He resembled an overgrown prep school student. Once seated, Ulbricht turned to smile and wave at his parents, giving his mother a thumbs-up while silently mouthing reassurances. But when his mother left the room during jury selection some hours later, he looked to be on the verge of tears.